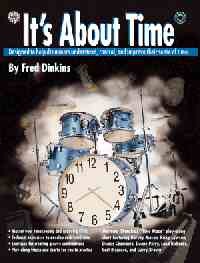 Tiger Bill Reviews the Fred Dinkins drum book and CD It's About Time from Alfred Publishing. Let's take a look at Fred's book/audio CDs, It's About Time, from Alfred Publishing. Fred's first recommendation for improving time and groove begins with exercises to help develop your "Fifth Limb." This is followed by Three-Limb Ostinatos (TLOs), Fourth Limb Patterns (FLPs), and Advanced Groove Independence exercises. The next step is in the form of exercises to help you "line up your limbs," as Fred says, "perfectly in time." Included are exercises that have you playing various subdivisions against the upbeat, playing on the "Big 1" (the first beat of each measure), and playing in the pocket of 2 & 4. This chapter concludes with a Play-Along chart that allows you to practice all skills learned up to this point. The chart can be played along with the included audio CD on your choice of tracks, with and without drums. Although the ability to play along with a metronome or click track is important, it is also necessary to be able to keep solid time without the help of a metronome. Using the accompanying CD, these exercises allow you to work at three tempos (slow, medium, and fast) playing to a metronome click with the click missing from from 1 to 32 beats of space. Also included are "Middle Changes," which are exercises to help you get used to maintaining solid time when changing grooves. This commonly occurs when playing from verse to chorus in a song. Exercises include practice in Middle Changes on upbeats and Advanced Middle Changes. A Play-Along chart combines all prior "space" examples into one exercise for review. How many times have you heard drummers speed up or slow down when attempting a drum fill? If you have this tendency, this chapter will help you correct the problem. Included are 40 fills containing from one to four beats per fill. The Play-Along at the end of the chapter helps you review all of the fill variations. "Artist" drummers have no problem playing the "hits" or, as they are also known, playing "ensemble figures" in a drum chart. These exercises help you perfect your "hits" and includes a Play-Along chart for review. As important as any "hit" is the way you "set-up" your hit on the drumset. A set-up is a rhythmic pattern drummers play that leads into the hit and complements the actual hits. A good clean set-up is another sign of a true artist drummer. If you want to hear a master at this, listen to any of Buddy Rich's big band recordings. Another Play-Along drum chart follows for review of hits and set-ups. This chapter covers a critically important concept of playing time. Time movement or "feel" is what defines the basic mood and emotional approach to a song. Included are exercises using three tempos (slow, medium, and fast) to help you develop each of the three basic feels: Playing on top of the beat, in the middle of the beat, and behind the beat. A Play-Along drum chart provides you with a way to practice changing the emotion in a song by switching between the three basic feels. This Play-Along is a drum chart that combines all of the previous exercises in the book. As Fred puts it, "If you have truly mastered time, then you will get to the end of the chart in one piece." As a bonus, the included CD contains examples of "The Time Maze" interpreted by each of the following artists: Fred Dinkins, Harvey Mason, Ricky Lawson, Curt Bisquera, Land Richards, Doane Perry, Gerry Brown, and Dennis Chambers. Examples of TLOs and FLPs in 3/4 time are included along with Fred's advice to practice in all time signatures and tempos, if you want to truly master time. Here's a list of Fred's favorite songs and drummers that can be studied to help you understand the topics in this book. They are divided into the following categories: The "Big One" Drummers, 2 & 4 Pocket Drummers, and Time Movement Recommendations. A description of each of the 74 tracks on the two included audio CDs. As Fred states in the intro to his book, "Knowing when and how to adjust your time intentionally can sometimes be the difference between merely playing notes and actually performing music." I couldn't agree more. No matter how technically proficient you become behind the drumset, your main task is simply to keep good time. That, more than anything else, is what makes a true "artist" drummer. I give It's About Time the thumbs up. If you want to take your playing to that next level, I can't think of a more useful guide than this book. It's definitely "about time" that someone wrote a comprehensive step-by-step guide that enables anyone to master the secrets of playing effective time. Time that's always solid, time that always cooks. After all, isn't that really what drumming is all about? It's About Time is useful for drummers of all experience levels. The book retails for $24.95, which is extremely reasonable considering that it comes with two audio CDs.